With thanks to Mr Edward Bostock CBE for the donation of this land. Celebrating 50 years of St. John Ambulance in this building. At Bostock.net we found the coat of arms for Geoffrey Rowley Bostock (1880 - 1961), the same as the one on this plaque. 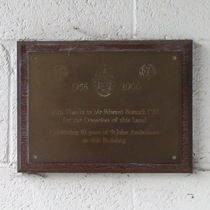 The bronze plaque is on the left of the entrance porch, the black one on the right. From Bostock's obituary we read: "He also gave a plot of land from his garden to St John Ambulance, where their local HQ is still to be found in Park Road, Teddington." Roland Bostock who runs that website tells us that "Norfolk Lodge still exists, it is just a bit off Park Road. Before my father gave St. John’s the land on which they built their hall, it used to be part of the kitchen garden of Norfolk Lodge. Later my father sold the rest of the kitchen garden, on which the neighbouring 6 residential homes have now been built. The house itself is behind all that, down the drive that is next to the 6 houses. I think you will see a Norfolk Lodge sign at the end of the drive, which also has a WWII style lamp post that father obtained when Teddington upgraded its street lights long time ago." The new houses, cobbled drive and lamppost are all immediately to the north, to the right of our photo.